"Oh, what do you know, it's a uni-whale-scorpio-Pega-squid-icorn-girl. What are the odds. You know, taken all together, it's more ridiculous than scary. I guess it doesn't have a cumulative effect." — Malifishmirtz, Phineas and Ferb episode "Excaliferb"
Shapeshifting comes in a lot of forms (in every pun-laden sense of the word). Most shapeshifters, however, stick to using a single concrete form at a time; this is true even if they swap shapes quickly during a Shapeshifter Showdown, or when truly skilled shapeshifters mix-and-match elements of their alternate form with their normal human form. Sometimes, though, a shapeshifter gets the idea that if more is better, why limit themselves to just one shape at a time? Why not transform into all of their forms, all at the same time, and become the ultimate Shapeshifter Weapon? They will, however, often encounter a slight problem: Instead of merging the best elements of their various forms into one sleek and awesome Hybrid Monster, it will literally combine and merge their various forms together, producing a chimeric monstrosity that only an Eldritch Abomination could appreciate. It may feature one head from each form; all the arms, claws, paws, legs, Combat Tentacles, fur, scales, and Body Horror that goes along with them; a half-dozen mismatched wings, and — like the proverbial cherry on top — the original head and/or upper torso of their Shapeshifter Default Form. Despite the patchwork nature of this form, it does still have some advantages. Like the power of intimidation, its supermassive size, and an Anatomy Arsenal stocked with every variety of Breath Weapon known to man (if not more), and can easily wipe out entire armies that approach anywhere within its "Instant Death" Radius. However, this form may have severe drawbacks over the individual component forms, and it's likely to be highly unstable or prone to catastrophic failure. If the shapeshifter can't keep focus he may enter a Superpower Meltdown where the Loss of Identity causes the body's components to attack each other, with the potential to become the very goriest of Shapeshifter Swan Songs. Because of all the above drawbacks, this is sometimes used as a nasty curse, typically a Baleful Polymorph that Mode Locks the victim. The independent body parts in this case are usually Guardian Entities outside of the victim's control, but won't attack him or her. They may however respond to his or her emotional cues, like a gorgon's snake hair or an owner's pets. The Shapeshifter Mashup is usually the penultimate step in the Bishōnen Line, right before a return to a humanlike appearance. Compare and contrast the "Mixed Form" variety of Fusion Dance, where a single character combines multiple transformations to create a new form, and Partial Transformation, where the shapeshifter adds elements of one form to another form. This might be considered a gory way to demonstrate Hybrid Overkill Avoidance. In Bleach, the Arrancar Aaroniero Arruruerie has absorbed the powers of thousands of Hollows, and for his final attack in his released form he transforms into a monstrosity combining many of these powers. Raphaello in B't X exhibited traits of every living being it had absorbed. In Inuyasha, recurring enemy Naraku frequently uses a mash-up form of the demons he's assimilated. This is especially true during his periods of weakness (something all half-demons go through regularly), when he becomes stuck as a gigantic mass of organs and tentacles that can't even move. Mr 2 Bon Clay from One Piece once used a mash-up of the most ridiculous facial features he knew during his fight against Sanji, in an attempt to throw him off-guard with laughter. Unfortunately, 90% of said features are his,note The only part that wasn't was Usopp's nose. which was so stupidly pointless that it just made Sanji angry. Aptom from Guyver can (quite graphically) absorb Zoanoids into himself to take on their form and powers, but for combat he usually takes on a unique form which combines as many of the best traits he has "eaten" as possible, which he updates from time to time. While these hybrid forms are generally quite sleek in appearance (sometimes moreso than the original creatures), "Evil Aptom" looks more like a traditional abomination due to his controller not fully understanding how Aptom's body works. In DC Nation, Fauna can use this trick, but it's quite difficult, and runs the risk of turning her feral. During the Final Battle of The Lion King Adventures, the Writer transforms into a chimera that has traits from every other villain in the series. The Thing (1982)'s final form is this. Also many of its earlier human/dog-alien shapes. Possibly the all-alien ones too, as we don't know what normal specimens of the creatures it was imitating on those occasions would've looked like. Happens to Marco involuntarily in "The Proposal", when he gets emotional over his dad's remarriage. He morphs a skunk/spider cross, a lobster/osprey cross and a poodle/polar bear cross at various points. He also morphs a trout with gorilla arms, which nearly suffocates him. This is actually a method people who are able to morph can do called the Frolis Maneuver. Might also be said of anyone who uses the Frolis maneuver to create a morph of the DNA of several individuals of a species combined. Elfangor and Aximill use a downplayed version of this trope, combining human features to create a completely new human appearance. In Harry Potter and the Prisoner of Azkaban, Professor Lupin notes this as a potential weakness of boggarts, which are magical creatures that change shape to become the greatest fear of anyone facing them. It therefore pays to approach them in groups, to confuse them; Lupin tells of a boggart who once tried to scare two people at once. One person was afraid of flesh-eating slugs, the other was afraid of headless corpses; the boggart turned into half a slug and didn't scare anyone at all. The game has multiple types of shapeshifting, some of which replace your abilities and others which enhance them — the latter type (most notably possessed by lycanthropes) can be used in conjunction with another transformation ability to invoke this trope. It's even possible for a creature to become infected with multiple types of lycanthropy (eg. a werewolf wereshark) and transform into multiple Animal or Hybrid forms at the same time. At high levels the Master Transmogrifist Prestige Class gains the "Infinite Variety" ability — whenever it transforms into another creature with a spell, it may add one aspect of a second creature whose form it could have taken with that spell. Krahka attempts to become a fusion of the Toa Metru for a One-Winged Angel, but she is unable to handle the physical and mental stress of wielding their combined powers for long before she collapses from exhaustion and barely manages to shift into a smaller form to escape. Done by the Makuta, on two occasions: first, he fused with three other characters, and ended up being a monstrous combination of their features (In the comics, books and his toy-form, at least. Subverted in The Movie, where they simply slapped wings to his pre-existing animation model.) The second example is his Alternate Universe-self, who merged with his entire Brotherhood, to become the only living Makuta. A common theory about Metroid: Fusion is that the SA-X's penultimate form is this (it resembles a Hornoad, the previous form of the X that infected Samus). Kefka in Final Fantasy VI has a half dozen penultimate bosses who are all merged into a grotesque spire of amalgamated shapes. Notably, many of them are clearly modeled on the heroes, making it feel a bit like a Shapeshifter Guilt Trip. The most infamous is the stage right before battling Kefka himself - it's Terra, the heroine, holding Kefka himself in a Pietà Plagiarism. That this image appears in a tower constructed by Kefka says a lot about how far his mind has collapsed. 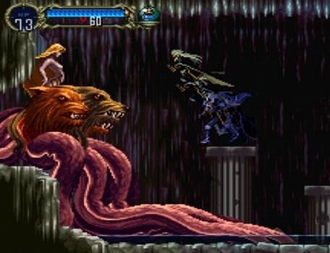 In Final Fantasy VII, Hojo's form in the second stage of his boss battle appears as nightmarish conglomeration of himself and his two minions from the first stage (to the extent that his limbs can still be targeted separately). By the third stage, he's got a full-on One-Winged Angel form going and looks human from the waist up again. This has become Malfurion Stormrage's default state since he woke up in World of Warcraft Cataclysm. In addition to the stag antlers he's always had, Malfurion now has bear-like feet, claws that look like Wolverine's, and feathers on his arms. Belberith in Devil Survivor is a combination of all of the previous Bels that he had absorbed off-screen. He does, however, avert the part of this trope that makes him have more weaknesses, as he's hideously overpowered. Grace: [looking at herself] ...well... if i had to guess, i'd say... all of them?" It didn't include all her innate forms yet. After this point Grace could engage in this with any or all of her forms on a whim. The results are referred to as Legion Forms. Can happen by default if a shapechanger has a miscast in Runewriters. A good example is Severian, who at the start of the series is stuck with a set of horns no matter what animal he is. This later is added onto after a miscast gives him tentacle hands. The rings and scepters of Homestuck royalty grant their bearers aspects of each of the sprite prototypings. While this makes the royalty progressively more powerful as more prototypings are added, it also makes their appearance progressively more bizarre. This is what changelings look like mid change in Charby the Vampirate, a nightmarish mishmash of limbs, tails and teeth as well as the struggling dissolving form of whatever or whomever they are changing into as it is absorbed into the mess. Ben himself had issues with this, usually after screwing with the omnitrix. After accidentally removing a piece, his transformations became (mostly useless) combinations of his aliens. Combining Ripjaws and Heatblast nearly kills him. Later in Ultimate Alien, Ultimate Kevin is a mashup of the new aliens and their powers with interest. In one of the later arcs of Omniverse, Kevin's twelve-year-old self (via flashback) and present self experience similar mashups (The twelve-year-old becoming a fusion of young Ben's second ten aliens, and the present one becoming a fusion of ten of Ben's newest aliens). By Season 3 of the reboot, when Charmcaster turns Kevin into an amalgamation of all eleven of the AntiTrix's aliens, it's barely a surprise anymore. Ben turns into this when the Omnitrix malfunctions back in Season 1. Invoked in an episode of Batman Beyond, where Terry's facing the genetic engineer responsible for the splicing craze, who's injected himself with the DNA of three forms to become an apex predator. Terry then injects him with a whole fistful of syringes, and... hoo boy. Alpha of Men in Black: The Series is a former human who's taken to tearing parts of various aliens and grafting them to his own body to become a superior being. At his most benign, he's an old man that can sprout about a dozen tentacles on a second's notice. At his most extreme, it's impossible to tell that the thing you're looking at was ever a human. In one episode of Care Bears, Beastly is given an amulet that allows him to transform into different creatures. Eventually, the amulet stops working and he is trapped as a Mix-and-Match Critter. On the Wild Kratts episode "Octopus Wildkratticus", Seven the octopus becomes entangled in both the brothers' Creature Power suits, and starts absorbing features from every other form of sea life he touches or eats. By the end, he's an octopus-walrus-great white shark-bowhead whale-mackerel conglomeration.